Practical Reservoir Characterization expertly explains key technologies, concepts, methods, and terminology in a way that allows readers in varying roles to appreciate the resulting interpretations and contribute to building reservoir characterization models that improve resource definition and recovery even in the most complex depositional environments. It is the perfect reference for senior reservoir engineers who want to increase their awareness of the latest in best practices, but is also ideal for team members who need to better understand their role in the characterization process. The text focuses on only the most critical areas, including modeling the reservoir unit, predicting well behavior, understanding past reservoir performance, and forecasting future reservoir performance. 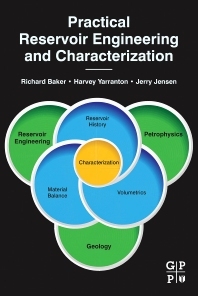 The text begins with an overview of the methods required for analyzing, characterizing, and developing real reservoirs, then explains the different methodologies and the types and sources of data required to characterize, forecast, and simulate a reservoir.